Scooby Doo and the Beach Beastie (2015) – What's New on Netflix Canada Today! Fred recently has had an extreme obsession with nets, as most of his plans to catch the monsters Mystery Inc. encounter are caught with nets. 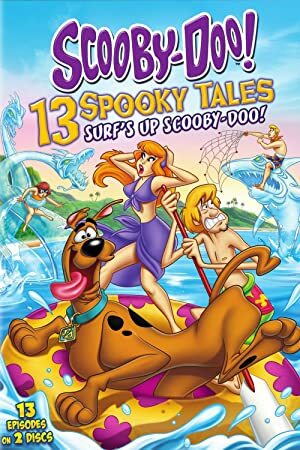 To get them out of his mind, Scooby and the gang head to a beach in Florida, where Daphne’s uncle Sandy owns a hotel, only to find that it is being haunted by a shape-shifting sea monster that is stealing jewelry. During their first encounter with it, Fred tries to use a net, but to no avail. Daphne tries to help Fred with his net problem by getting him to relax in an area without nets, which is difficult, since the lobby and beach have nets all over the place. Velma goes to Kurt’s hotel, the rival hotel next door. Kurt is somewhat glad about the commotion, as the people who have left Sandy’s hotel in fear of the monster have come to his hotel. However, a holographic water show, which is supposed to be a big attraction at Kurt’s hotel, is closed for repairs, and the repair company, Brownstone Industries, is taking too much time to fix it. Meanwhile, Shaggy is sad that Scooby is spending too much time with another guest’s dog. Shaggy finds comfort with Annette Brownstone, the female dog’s owner, and the wife of Grafton Brownstone. Annette, like Shaggy, also feels lonely, as her dog is with Scooby and her husband is nowhere to be found. Later in the night, the hotel is attacked again by the monster, and is attracted to Annette’s necklace. Using the necklace as bait, the gang gets the monster to follow them, noticing a human silhouette in the center. Velma tells Fred to find them a net, which he builds out of video cassettes. Fred successfully captures the person behind the monster, which turns out be Grafton Brownstone, Annette’s husband, and head of Brownstone Industries. Grafton had actually pawned Annette’s necklace for money, and the necklace that Annette was wearing was fake. In order to prevent Annette from finding out, he planned on stealing the necklace. Annette and her dog go to post Grafton’s bail, and Scooby and Shaggy reconcile. After Fred experiences a nervous breakdown, the gang decides to take up an offer from Daphne's uncle to stay at his Florida resort. Soon after arrival, they realize they actually have a mystery on their hands.